Looking for new and fresh design of iPhone? well, you probably could get that in the second half of 2014, according to Bloomberg. Apple planned to unveil two new models of iPhone. The one with 4.7 inches screen size and the 5.5 inches. 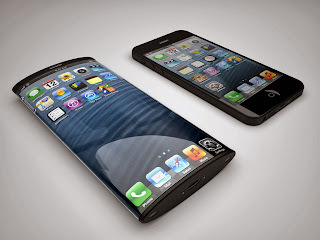 Not only that, it also has a curved-glass design and more responsive sensors. According to Bloomberg site, "Apple Inc. is developing new iPhone designs including bigger screens with curved glass and enhanced sensors that can detect different levels of pressure, said a person familiar with the plans." These Apple action is still in the plans and in development, as Bloomberg posted. "The new Apple handsets are still in development and plans haven’t been completed, the person said"
For the meantime, please bookmark this page now or visit this site more often for you to be updated. You may also share this post to your friends so they may know about the Curve and Larger iPhone in 2014. Comments or suggestions about "Apple: Curve and Larger screen of iPhone in 2014" is important to us, you may share it by using the comment box below.